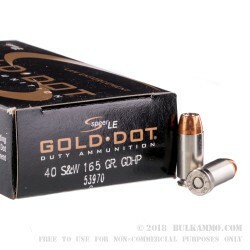 Speer Gold Dots offer category-leading self-defense performance in the .40 S&W cartridge. 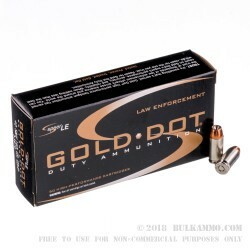 Highly popular among police agencies using the .40 S&W, Gold Dots use a unique bonded-core design that virtually eliminates the chance of core-jacket separation. Each Gold Dot bullet is designed to make the best use of its respective cartridge. This .40 Smith & Wesson load uses a 165-grain bullet which achieves a muzzle velocity of about 1150 fps. Each cartridge uses reliable CCI primers as well as nickel-plated brass cases. 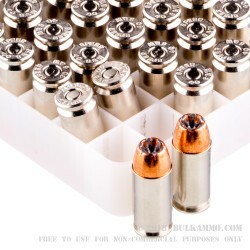 This box of 50 rounds facilitates bulk purchases by law enforcement and citizens alike. Shoot what you carry for best results! Speer is an Idaho-based manufacturer of high-quality bullets. 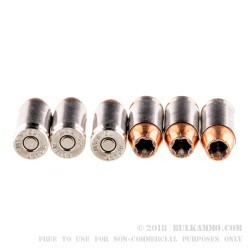 Originally a supplier to other ammo loaders, the company has achieved great success with its own line of high performance self defense Gold Dot ammo and Lawman range rounds, which mimic the ballistic properties of their Gold Dot counterparts. Founded in 1944, the company operates from Lewiston, Idaho alongside sister company CCI.